Allows to drain and relieve the limbs, on soft or hard defects. Useful to accelerate the recovery of certain traumas. Drain, reduce soft and hard defects. Particularly recommended to accelerate the recovery of certain traumas. Draining effect is ideal for the recovery of limbs after effort. 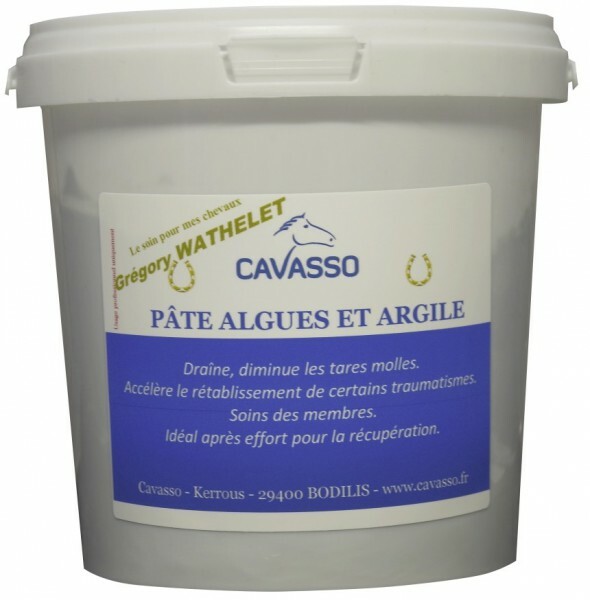 On limbs that have a fragility, clay algae paste provides comfort of the legs. On large wheels, 3 care to follow, then 1 per week in prevention, reduces the risk of return of it. Stir the dough until a smooth dough is obtained. Apply a thick layer to the area to be treated, wrap in an absorbent material (paper towel) and place resting strips. Leave to act between 2 and 12 hours maximum. Rinse with warm water. The shampoo cavasso is recommended for a complete cleaning and to preserve the virtues of marine assets. 300 grams of paste for a care of 4 members.